‘Unsustainable’ is not the band’s official second single from their forthcoming album, ‘The 2nd Law’, but merely the second taste of the new record. The track was given to fans on August 9 when pre-ordering the album and was simultaneously released on You Tube. Since its unveiling, things have gotten quiet heated between listeners with regards to the brostep sound that characterizes the track. No question, ‘Unsustainable’ is a dub-step influenced track. Given the current popularity of the genre it would be easy to be cynical about Muse’s choice of sound. However, most agree that dub-step shares many similarities to (nu-)metal and groove-ridden rock (ala Rage Against The Machine) with some people venturing so far to say that the genre itself is an electronic version of rock and metal. Therefore, it really shouldn’t come as a surprise that the trio would dabble in dub-step. More importantly, ‘Unsustainable’ is more an intro or interlude than an actual song. The track is largely instrumental with the exception of the occasional vocal wail and the first 90 seconds of the 3:48 track is made up of bombastic, cinematic, classical-influenced, apocalyptica with a news reporter speaking of our impending doom. When the band finally kicks in we’re introduced to a bass-heavy groove and the song’s much-discussed brostep element. Let’s be honest, it’s not that much of departure. Muse has successfully incorporated electronic elements and countless other influences into their music previously whilst still sounding like Muse. Make no mistake, the track is undeniably Muse and the band are not reinventing dub-step nor incorporating anything more than dub-step’s basic principles into their songwriting. 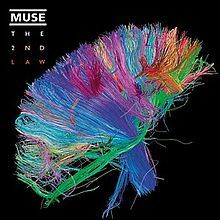 According to the band, ‘The 2nd Law’ is a diverse record and by all accounts, ‘Unsustainable’ will simply be the one track on the album where the band plays around with dub-step. ‘Unsustainable’ follows the first single and London 2012 Olympics theme song, ‘Survival’, which was released last month and which the band will be performing live at the closing ceremony on Sunday August 12. ‘Madness’ will be the official second single released on August 20, with the band’s album due in October. Watch the video for ‘Unsustainable’ below. LOL! You might not have realised yet that music and the review of is purely subjective. A quick glance at the rest of the reviews would also show that a number of genres are indeed covered. That said, I always welcome an expert to set the record straight for everyone.